As Director of the Wilmot Cancer Institute, I seek to provide the highest level of compassionate care for patients, ensuring access to novel treatments and clinical trials whenever possible. My background brings the entire continuum of lymphoma experience to patients, from diagnosis through all treatments including autologous stem cell transplantation and survivorship. We have built a strong team in Rochester to care for patients with lymphoma that is absolutely first rate and internationally recognized. We have expertise in hematopathology, radiation oncology, dermatology and neurology, in addition to hematology and medical oncology. Driving this team toward excellence – and seeing our success – is highly rewarding. Our understanding of blood cancers in general, and specifically lymphoma, has enabled us to cure a subset of patients – and that attracted me to this specialty. Happily, this fraction of cured patients has substantially increased during my almost 20 years in this field. Since lymphoma can affect anyone – males, females, young patients, older patients and all ethnicities – I am rewarded by the interaction with a variety of patients. Finally, lymphoma is a complex set of diseases that can affect any organ system and I was drawn to that challenge. My practice team includes Lynn Rich, NP and Anna Morrison, RN. Jonathan W. Friedberg, M.D., is Director of the James P. Wilmot Cancer Institute, and Director of Hematological Malignancies Clinical Research. He is a driving force behind the operations of our clinical programs and a key member of the center's lymphoma Specialized Program of Research Excellence, funded by the National Cancer Institute. 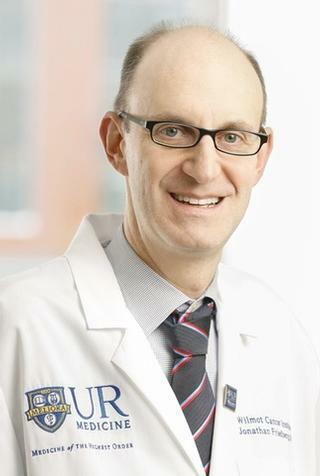 Friedberg is a member of the lymphoma committee in the Southwest Oncology Group, and serves as principal investigator on many local and national lymphoma treatment protocols for both Hodgkin lymphoma and non-Hodgkin's lymphoma. Dr. Friedberg received his medical degree from Harvard Medical School. His postgraduate training included an internship and residency at Massachusetts General Hospital. He also completed a medical oncology and hematology fellowship at Dana-Farber/Partners Cancer Care in Boston. Dr. Friedberg also has an M.M.Sc. degree from Harvard Medical School in clinical investigation. He holds subspecialty certification in Medical Oncology and Hematology. His research interests focus on development of novel therapies for patients with lymphoma. Most recently, he was awarded the Scholar in Clinical Research award from the Leukemia & Lymphoma Society, based upon his work with an oral inhibitor of a protein called Syk, which demonstrated efficacy in the treatment of several different forms of lymphoma, and was selected as a plenary presentation at the annual meeting of the American Society of Hematology. Clinical Oncology Research Fellowship " Immunotherapy of Hodgkin's Disease"
Diefenbach CS, Connors JM, Friedberg JW, Leonard JP, Kahl BS, Little RF, Baizer L, Evens AM, Hoppe RT, Kelly KM, Persky DO, Younes A, Kostakaglu L, Bartlett NL. "Hodgkin Lymphoma: Current Status and Clinical Trial Recommendations." Journal of the National Cancer Institute.. 2017 Apr 0; 109(4)Epub 2016 Dec 31. Rimsza L, Fedoriw Y, Staudt LM, Melnick A, Gascoyne R, Crump M, Baizer L, Fu K, Hsi E, Chan JW, McShane L, Leonard JP, Kahl BS, Little RF, Friedberg JW, Kostakoglu L. "General Biomarker Recommendations for Lymphoma." Journal of the National Cancer Institute.. 2016 Dec 0; 108(12)Epub 2016 Dec 16. Dhakal S, Bates JE, Casulo C, Friedberg JW, Becker MW, Liesveld JL, Constine LS. "Patterns and Timing of Failure for Diffuse Large B-Cell Lymphoma After Initial Therapy in a Cohort Who Underwent Autologous Bone Marrow Transplantation for Relapse." International journal of radiation oncology, biology, physics.. 2016 Oct 1; 96(2):372-378. Epub 2016 May 27. Chapter Title: Monoclonal antibodies in lymphoma: the first decade. Chapter Title: Non-myeloablative radioimmunotherapy for lymphoma.